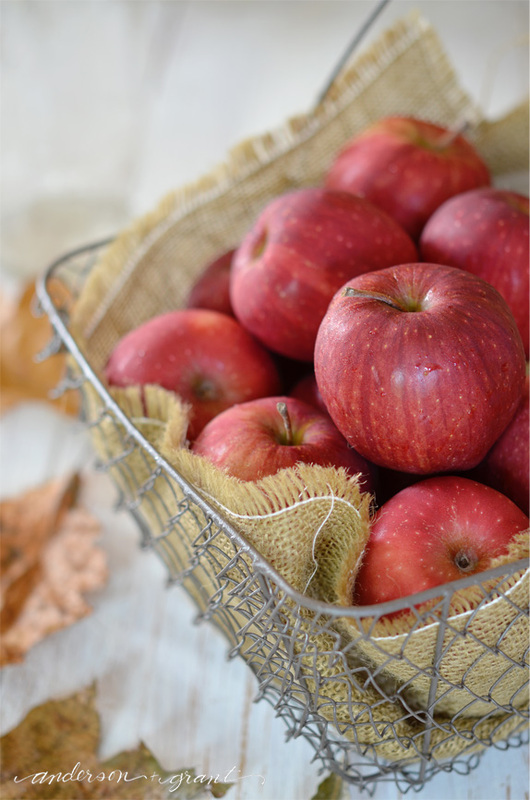 Apple is one of the classic flavors of the fall season. I mean, is there anyone who doesn't enjoy some hot apple cider, homebaked apple pie, or caramel covered apples during the autumn? 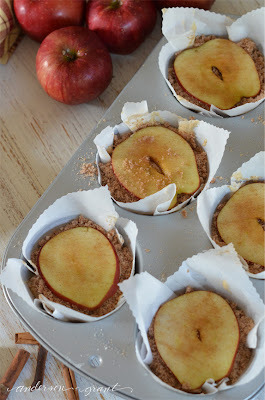 I was inspired to try this interesting recipe on The Cake Blog for apple muffins and decided to give them a little twist by adding a crumb topping. 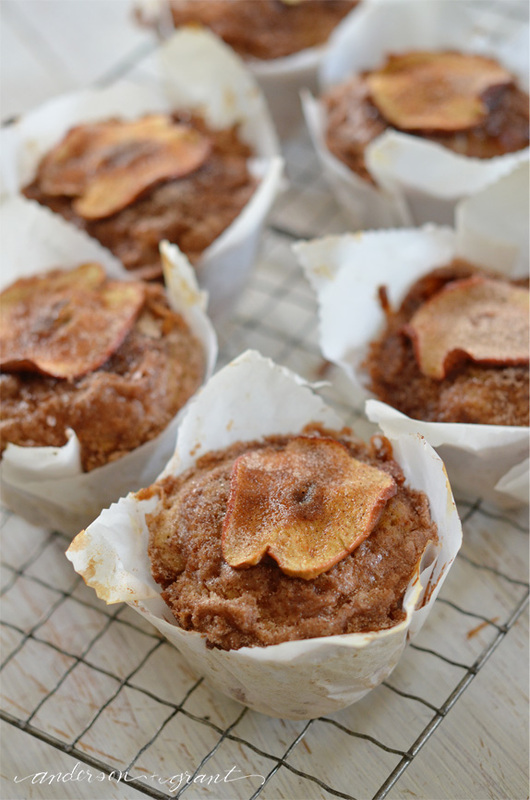 And to add to the fall perfection of this apple recipe, your house will smell AMAZING while the muffins are baking in the oven. The scent of cinnamon, nutmeg, and apple will instantly put you in the mood for fall. You may even be inspired to go out an rake some leaves. Then again, maybe you won't! To make these muffins more like the fancy kind you can get in a bakery, I baked the batter in a Jumbo Muffin Pan . You could use a regular sized muffin pan if that is what you have, but the cooking time may have to be adjusted. The most special part of these Rustic Apple Muffins is the addition of a slice of apple on the top. It gets crispy from a coating of sugar and cinnamon....almost like an apple chip. I also made some DIY wrappers using parchment paper. To make these yourself, cut squares of parchment measuring between five and six inches. Spray the muffin tin with a little cooking spray and then press the wrappers down into the pan. After the muffins are out of the oven and cooled, they can be wrapped with a little jute or baker's twine tied into a bow. 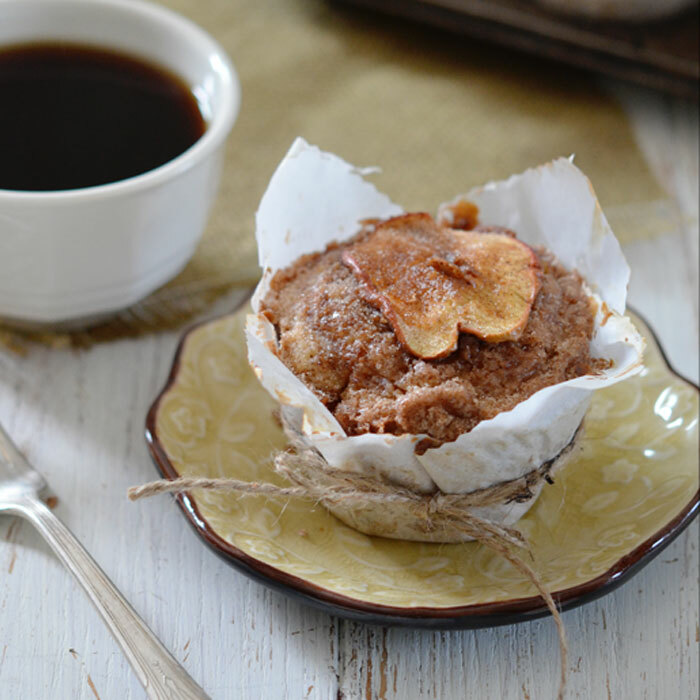 These muffins obviously make an amazing breakfast paired with a cup of hot coffee, but are also cake-like enough to be served with a scoop of ice cream for dessert. They are best warm right from the oven. Preheat your oven to 375 degrees. 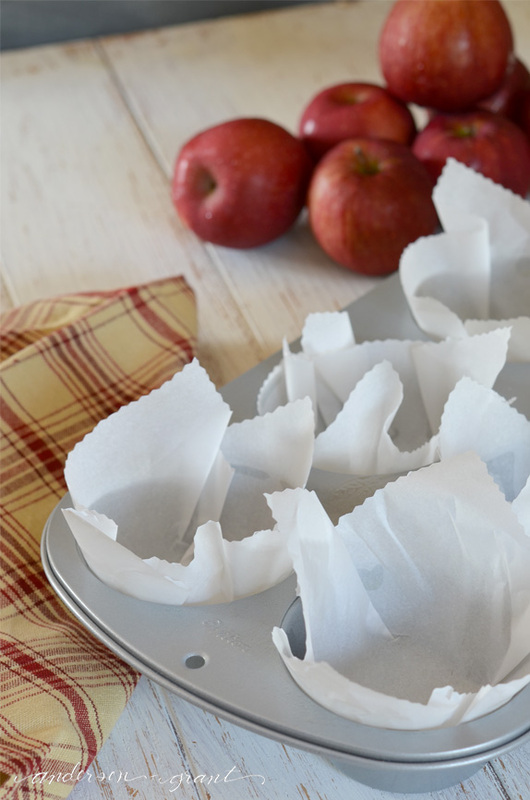 Spray the cups of a jumbo muffin tin with cooking spray that then place a muffin cup or parchment paper square in each cup. 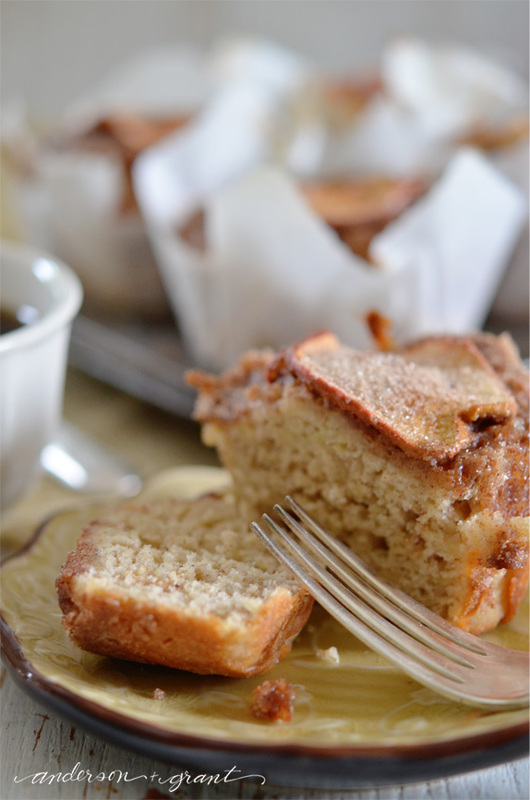 To make the muffins: Whisk flour, baking powder, salt, baking soda, cinnamon, and nutmeg in a bowl. Set aside. In a separate bowl, stir melted butter, egg, sugar, buttermilk and applesauce together. Add in the fresh grated apple. Pour a third of the flour mixture into the egg mixture and stir. Add another third and stir. Add the remaining third and stir just until combined. Spoon the batter in the lined muffin tins. 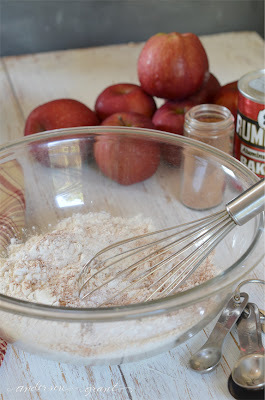 To make the topping: Mix the ingredients together with a fork or pastry blender until everything is crumbly. The mixture should resemble damp sand when it is ready. 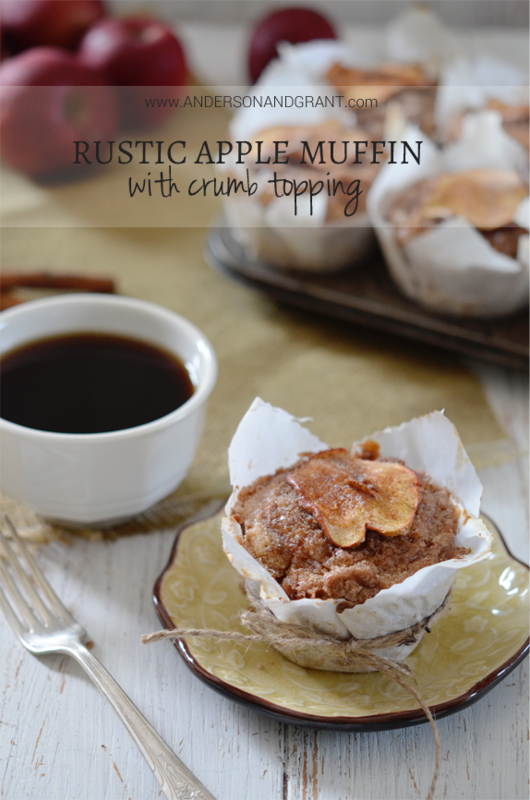 Sprinkle the crumb topping over each muffin and then top with a thin slice of apple. 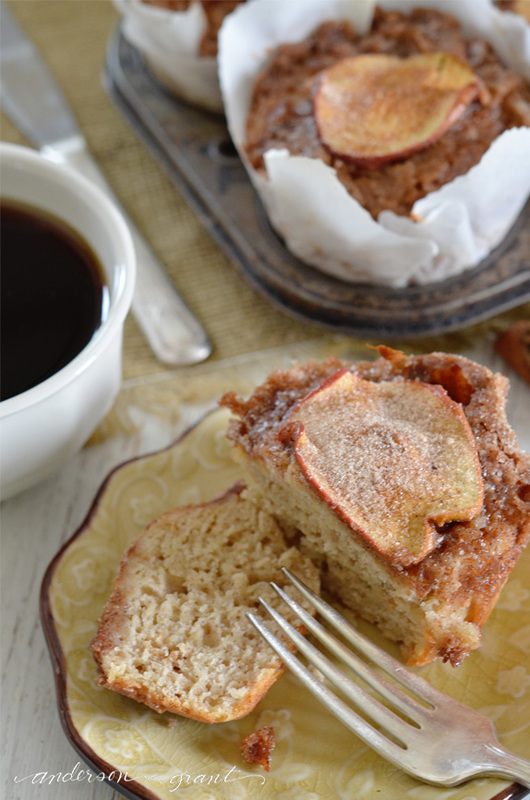 Sprinkle with a little more cinnamon and sugar. Bake the muffins at 375 degrees for 22 to 24 minutes or until a toothpick inserted into the center of the muffin comes out clean. 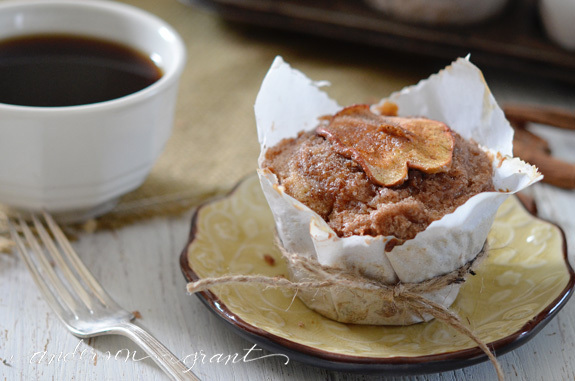 After you remove the muffin tin from the oven, sprinkle the tops of the muffins with a little more cinnamon and sugar. Allow the muffins to cool in the pan for five minutes before removing to a wire rack.